You are currently browsing the tag archive for the ‘ghosts’ tag. A group of us met at my friend Lisa’s before going to the opening night of Where the Wild Things Are. It was important that we met there because she lives closest to the cheapest theater in the Twin Cities, the Woodbury 10. It would also become important because of what happened before we left for the movie. Where the Wild Things Are is an important interpretation of Maurice Sendak’s children’s book because it’s not for children, but for adults, particularly adults who were once a child like Max was. Max’s dad wasn’t around, his mom worked full-time and his sister was just old enough for it to not be cool to hang out with Max. He kept to his igloos, forts, and wolf costume. Max didn’t understand why his father rejected him and his family and didn’t know how else to express his frustration but through tantrums and running. After a pre-dinner tantrum and biting his mom, he ran (and sailed) all the way to where to where the wild things are. The implications for me became clearer. About a half hour before we left for the Woodbury 10, Lisa’s neighbor stopped by. Lisa had never met this neighbor before, but had watched the family dynamics from a distance and knew they inclined toward a different social understanding and interaction. “Can I use your phone?” the 28-year-old woman asked as her little redheaded girl huddled behind her knees. “Oh she’s just scared of your ghosts on your deck. You do know this house is haunted right?” the woman said. We all shock our heads. Not being in opposition to ghosts, knowing full and well of a supernatural realm present in the world, we all giggled a little as our Western mindset taught us to do in the face of ghost believers. Though this young mom probably influenced her daughter’s belief and knowledge of ghosts, I couldn’t help but think of this young girl when we left the theater that night. Her white jacket and blue lightsaber like Max’s wolf attire. She would probably eventually deny what she knew at the time to be real, the existence of ghosts, but for now she believed in what no one else could see. Fatherless, as the mom told us “she tried that marriage thing once,” she faced the world of ghosts probably fighting as Luke Skywalker fought evil with his blue lightsaber. Though the little redheaded girl seemed happier than Max, my heart broke for her. The threat of an incomplete family is a horrifying experience I don’t know how to deal with. Not only is my family complete, but most of my friends’ families are complete so with ignorance I stood giggling at this girl’s apparitions, all the while loving fantasy films and believing in God. 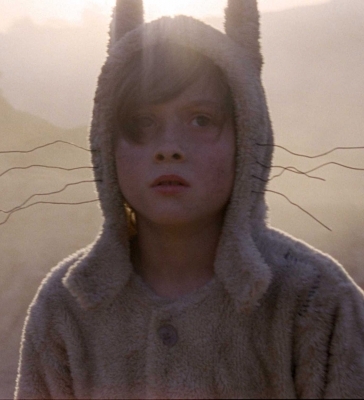 Where the Wild Things Are is an important film for its beauty and interpretative imagination, but maybe mostly important in its provision of emotional and psychological understandings of broken families and the children affected. So that I might call the redheaded girl imaginative like Max, and not weird as I initially thought of her.